Dolphin watching is one of the main attraction of Lovina. 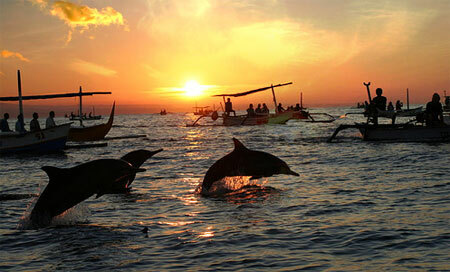 Each moring around sunrise hundredes of dolphins visit the coast of Lovina, hunting for a small fish. The visitors can sail using the traditional fishing boat before sunrise. The beautiful scenery of the rising sun above the mountains, while dozenz of dolphins tumble and jump out of the sea around your boat. Banjar Hot Spring is located in Singaraja Regency, north part of Bali. 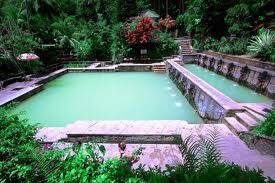 This hot spring is situated in the midst of the jungle in a beautifully landscaped tropical garden. The sulphuric water is of the volcanic origin and has an agreeable warm temperatures of 37 degrees celcius that ideal for people suffering from rheumatic diseases. This hot wellspring source is predictably built since of hundreds of year ago and since the Japanese colonize the Indonesia, this place has developed into three pools to relocate the water for taking a bath. Brahma Vihara Arama the Buddhist Monastery is more than just a "tourist attraction". It is still used and you can find groups of people staying in the Ashram nearby. 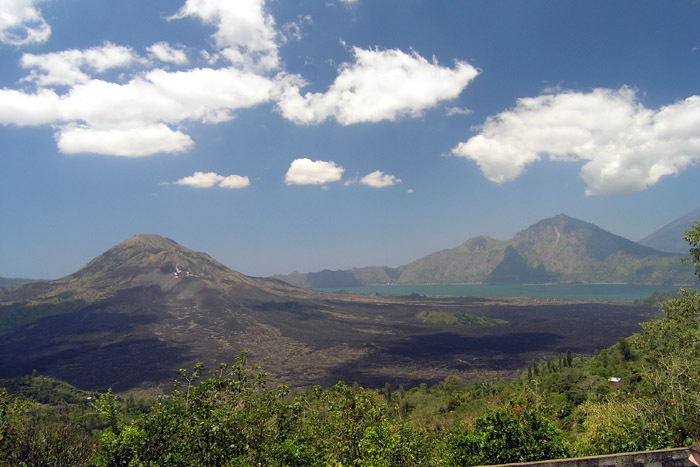 Buddhist Monastery is situated in the hills above Lovina and offers nice view. 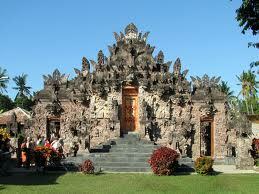 It has some Buddha statues and also Balinese decorative carvings. This shows the solidarity amongst the Balinese people and the Buddhist community who live in Bali. On the highest level of the complex you find a Stupa, allmost like a small version of the Borobudur in Java. In the temple you find references to the Borobudur. Beji Temple is the biggest "Subak" temple in Bali. Subak is an irrigation system that only own by the Balinese. This holy temple is dedicated to worship "Dewi Sri", the Goddess of Rice. Beji Temple was built in 15th Century. What makes this temple unique is because it's full with the spendid carving and beautifully painted all over it, inner and outer sides, entire length of the wall, even the small part of it. 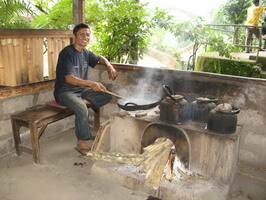 Traditional Bali Coffee Processing or Bali Agrotourismis place to see various Tropical plantations such as coffee robusta, pineapple, Balinese snake fruite(salak), plain Balinese potatoes, fruit stars, cacao, jack fruit, durian tree and many more, experience to see how to make Balinese coffee in very traditional ways, and taste the fresh of Balinese coffee or ginger tea with green view river valley and also They sell variety of theirs original Balinese coffee products, herb oil and etc and see the civet cat the most expensive coffee maker, wellknown as Luwak , its produce "Coffee Luwak". Bali Art Villages along the way.... the gold and silver smith is Celuk Village, there are a lot of Huge silver shop inthis village. Batuan Village to see the painter make own creation and imagine. Textile factory at Tohpati Village. The woodcarving Village name is Mas and Kemenuh Village, both village produce very good quality of woodcarving made from very hard wood such as teak, mahogany, ebony and hibiscus wood, those of wood import from another island Java, Sumatra and Sulawesi. Jimbaran is located in south of the airport, the beach has white sand. The area originally fishing Village with fish market. Now there are luxury hotel built, Bali Intercontinental Resort and Four Season Resort. Jimbaran bay well known with beachside Sea food Restaurant while enjoying the sunset and scenery with cold drink and a fresh grill fish with live group music by local singer offered international song and the sing title could be request. 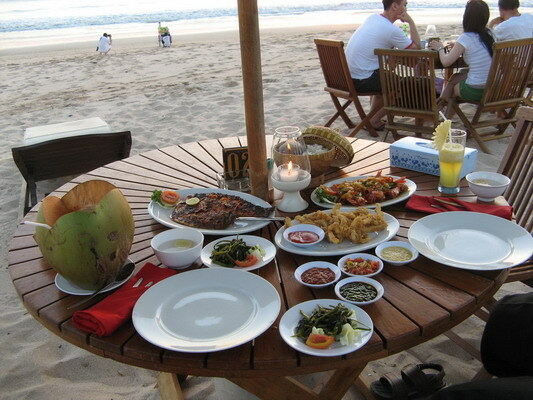 The most famous Grill Sea Food restaurant at jimbaran beach is Local Cafe. The sea food cost by weight.